Hey readers! Fashion Coaching and the City is already at its 8th greeting! Here in Seoul, Spring has arrived but with its usual capriciousness. Beware the Spring flu, wherever you are! In this column, we will talk about the advantages of having 3 completely accessorized outfits, as well as the steps to achieve them! For those of you who have spent some time taking action on some of the tips I have shared, you may already have your metals in their right color categories or coordinated outfits that capitalize on your natural or intentioned silhouette. But there are always those readers who are pressed for time, and today's tip will hopefully benefit your busy lifestyle! 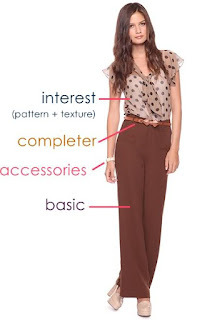 First, let's take a look at what the term 'Fully Accessorized' means for an outfit. For those of you who like to shop, have you ever wondered why you shop quite often but once you bring your shiny new clothes home, the final outfit you put together looks like the same kind of 'blah~?' Maybe you wondered it was due to the different lightings or slimming mirrors in the clothing store, or perhaps you feel like you had given too much credence to what the store clerk said. Well, actually, the real culprit here are your 'accessories.' Most clothing items when mix and matched without accessories almost always end up looking like a version of a 'school uniform.' So, let's take a look at this formula! Let's put together some outfits, using this formula! Now, set aside 30 minutes or more to create YOUR OWN fully accessorized outfits! Make all three of them! Most people can easily create 3 completely accessorized outfits without having to go shopping. You may start off with a black base outfit, then a white one, and a jeans one. Or you may choose to pick one favorite clothing item and see if you can produce 3 completely different outfits using various accessories. This technique is highly recommended for people who are moving houses or constantly on the move, or frequent business traveler. When you have at least three completely accessorized outfit in your own wardrobe, those splendid window displays will cease to pull on your heartstrings and purse strings! Your well invested 30 minutes may well protect your valuable cash! As always, thank you for reading and stay stylish! I'm here to cheer you on!